Honor announces low-cost 6A smartphone | What Hi-Fi? The Honor 6A runs Android 7.0, has a 13-megapixel camera and 3020mAh battery that should last over a day. 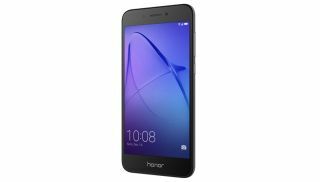 Honor, which apparently considers itself "the smartphone brand for the young at heart" has announced a new smartphone - the 6A. So if you're feeling particularly old or grouchy today, stop reading now. So what's it offering? It has a 13-megapixel camera on its back, and a five-megapixel camera up front. Those pictures display on a 5in, 1280x720 screen housed in a 8mm thick, mildly curved body. Running the show is Android 7.0, powered by a Qualcomm Snapdragon MSM8937 octa-core processor. There's 2GB of RAM and 16GB of storage, which can be beefed up with 128GB of extra memory via microSD card. It shouldn't run out of juice too quickly either - the 3020mAh battery should last (according to Honor) for a day and a bit before it needs to be charged. If you want to pick one up, the 6A (in dark grey) starts at £150.